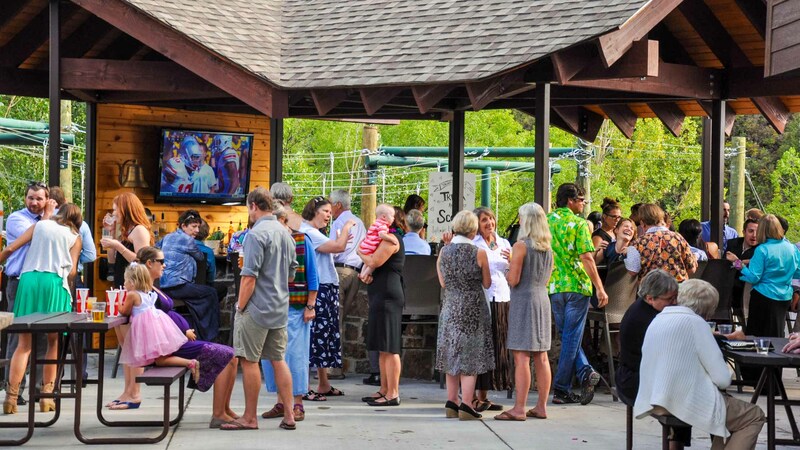 Not only does the Glenwood Canyon Resort boast the most scenic and gorgeous location in all of the western slope, we have some of the coolest (and convenient) amenities to offer our guests. From the most adventurous activities requiring nerves of steel and uncommon strength to the least adventurous activity of doing your laundry, we’ve got what you’re looking for right here on site. To highlight a few, let’s start with the No Name Bar & Grill on our over-sized outdoor terrace. Overlooking the Colorado River, it provides a perfect setting for breakfast, lunch, drinks or dinner for the entire family and the food and drinks are fabulous! It’s also the setting for our nightly activities of karaoke, bingo, movies, ice cream socials, corn hole tournaments and a host of other fun stuff. It’s also a great place to just hang out, catch up on your emails or watch our other guests having a blast soaring through the air high above the Colorado River on our thrilling zip line adventure. Of course you came to Colorado to have fun and we wouldn’t dream of letting you down! Located right on the resort property is the Outdoor Adventure Center featuring Defiance Rafting and Glenwood Canyon Zip line Adventures. Picture yourself crashing through the thrilling Shoshone Rapids on your whitewater rafting trip down the mighty Colorado River. Or perhaps you’d prefer a more peaceful float through the Canyon? Wanna tackle the river on your own in a Ducky rental? We have many great options to choose from! How about stepping off a 40′ platform to soar across the Colorado River on a zip line tour? Maybe your nerves are made of steel and the challenge of our High Ropes Course is more up your alley. Tackle the 40′ Climbing Wall and finally declare exhaustion as you head back to the No Name Bar & Grill to replenish with food and drink! Need camping supplies or maybe a souvenir for those back home? Stop by our resort office and store where we have basic camping needs including wood & fire starters, ice, cold drinks, tent stakes, propane, and all the s’mores fixings you may need. Don’t miss out trying our favorite s’mores recipe with peanut butter cups! You’ll find other items for your laundry and RV’ing needs as well. Also located in our resort store are fun little trinkets and things that make great gifts for the ones back at home as well as souvenirs in the form of hats, t-shirts, sweatshirts and such. Make sure you pick up a zip line t-shirt to prove you actually did it! We offer shuttle service to and from the Hot Springs Pool in Glenwood Springs during the summer season. Please check in the office for the daily schedule and to reserve your space. Kick back and relax on the most scenic outdoor deck in Glenwood Springs! Grab a freshly grilled burger and a brew after an exciting whitewater raft trip; or join a western cook-out at the end of an adventure filed day on the zip line and challenge courses. There’s never a dull moment at the Bar & Grill. Swing set, slides, climbing fort, play sand and more! The resort is located right on the banks of the Colorado River with our own private river access available to our guests. Coin operated large capacity washers and dryers with counter space for folding and chairs for your comfort while you wait. A convenient feature for those on site or just traveling through. Centrally located in the resort and stocked with necessities while away from home. We offer firewood, ice, cold drinks, candy, snacks, ice cream products, toiletries, sunscreen, sunglasses, t-shirts, hats and souvenirs. Whitewater Rafting, Ducky (inflatable kayaks) trips and rentals, Ziplining, High Ropes Adventure Course, Climbing Wall, and a variety of combination trips!